Edible Jewelry– Fruit Necklaces Make A Fun Kids Snack! 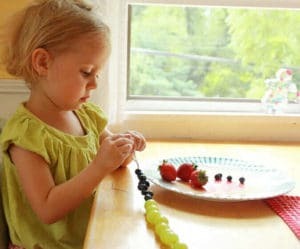 Fruit necklaces are a healthy and fun kids snack. Make your own edible jewelry necklace for a yummy and portable kids snack! If you ask my kids, snacks should be fun, yummy, and portable. And if they can help make them, all the better. 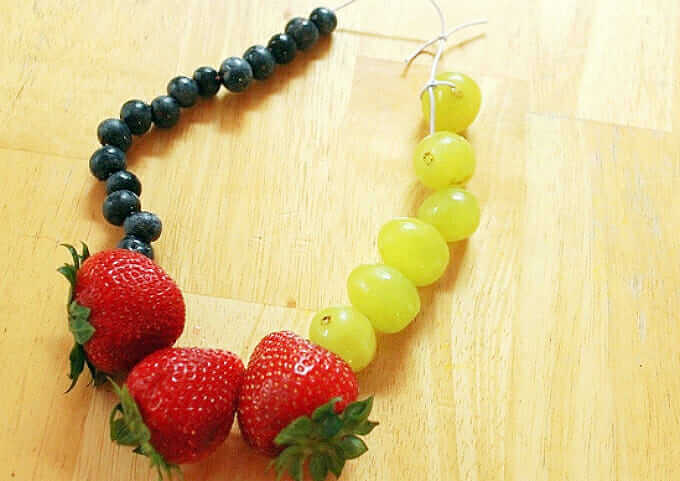 These fruit necklaces definitely fit the bill as a fun kids snack. Plus they are healthy, which makes me happy. Maia, Daphne, and Marlise each strung their own fruit necklace snack with fresh fruit “beads” yesterday during a playdate. Then they draped them around their necks and proceeded to eat them right away. This was a spur-of-the-moment idea inspired by cheerio necklaces, popcorn garlands, and all of the colorful fresh fruit we had in the house. 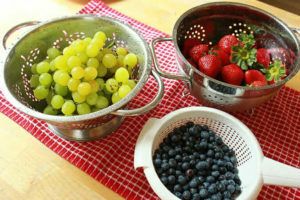 To begin, wash a variety of fruit (we used grapes, strawberries, and blueberries). 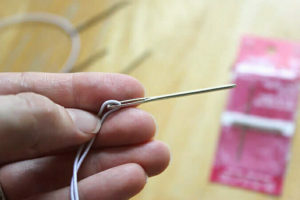 Then, cut two-foot lengths of elastic cord and thread each onto a chunky yarn needle (you could also use yarn or embroidery floss and an embroidery needle). Next, set out plates for each child to work on. 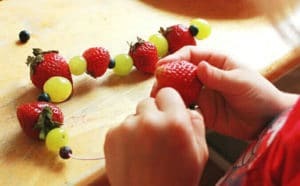 Start each necklace with one piece of fruit knotted in place to hold all the fruit “beads” on the necklace. Create a pattern for your necklace. Maia and Marlise each made different patterns with their fruit. First, Daphne strung a long row of grapes and then added some blueberries at the end. By the way, she called hers a snake and didn’t want me to tie it into a loop. Meanwhile, the older girls ate two necklaces each for their snack. Daphne snacked as she worked, then gave her snake to Marlise as a gift. Fruit necklaces were definitely a fun kids snack for our playdate! I think they could be a unique addition to party or a picnic as well. What do you think? Any other ideas for fun snacks for kids? This is great Jean. I know my daughter would think this is awesome. This is great. My daughter would like this as well. How much fun and way more nutritious than the candy necklaces I loved as a kid. We have a growing in the garden camp in two weeks and I am so going to make these with my kiddos=). We love to eat around here. The needles can be obtained at Micheals craft store. I do lots of yarn stuff. Get the metal ones instead of the plastic, the plastic can break really easily. I think this was a good idea. Kid’s are eating while doing this necklace. This will gives more fun for them. We can also challenge them to express their talent. Kim, I’m so sorry your family is going through a difficult period right now! I’m glad you’re able to find some ideas here to engage your daughter. If you’d like help finding anything in particular, in the way of arts and crafts activities, please let me know. Hmm, perhaps you could also plan to make a necklace with non-edible beads that she can keep? THen maybe she won’t feel as torn about eating her pretty fruit necklace. Let me know if you try it, Melissa! This was definitely a fun activity (and snack!) for them. What a great idea thank you! my little girl loves necklaces and she loves fruit! Do you think she is a bit too young to have a go with a needle? She turns 3 next month? Daphne is 2 3/4 and was totally fine with it. The needles we used were blunt, but she use a sharper needle recently (for a real bead necklace) as well and did fine. If you do it with her, I would suggest showing her how to use it carefully, talking about how the needle is sharp (if you use a sharp needle), letting her touch the tip to see how it’s sharp, and then supervising closely at least at the beginning. You know your daughter best, though, so I would go with your gut instinct. Does it stain their clothes? I LOVE the idea, but that would be my only hesitation. Love this; so fun and healthy! :) We would love to invite you to join us at Saturday Show & Tell on Cheerios and Lattes! We know our readers will love your ideas! Have a great weekend! I love this idea…Does anyone have any ideas of what could be used for edible “string”? maybe fruit laces?